When you wake up today in your new Frozen bed, you will be three. It seems like just yesterday you were figuring out how to stand up in the hallway of our old house. I can still see that moment vividly. You were standing in a sunbeam, wearing a short sleeved red top and denim-colored capri leggings — a moment of discovery illuminated by the afternoon rays. A little more than two years later, you are now a sprinter, an emerging gymnast, a jumper, a climber. Unafraid of almost anything. That trait will serve you well in life. It’s been a big year for you, Sweet Pea. You spent the summer mastering the playground. You learned to ride a scooter. You finally figured out how to jump really high off the ground, which was the equivalent of winning the toddler lottery. You discovered that switching up your hiding places during hide and seek is key to success. The front of your hair caught up with the back, evening out the tiny mullet you had during some of your first year. And your curls — those beautiful curls! I love them. Last fall, you got your adorable pink glasses which have become so much of your personality. I was so proud of you at the eye doctor, going through all the eye tests like a trouper. This, too, was the year you began caring about your outfits, and choosing your own clothes and accessories. You have a thing for shoes just like mom. Every time you got a sticker, you stuck it to the middle of your forehead. People sometimes stared at your forehead sticker piles in public, but who cares? Who am I to stifle your fashion sense? Your most coveted clothing items: Tutus, the color pink and various shirts bearing Hello Kitty, Frozen, minions from Despicable Me and Minnie Mouse. 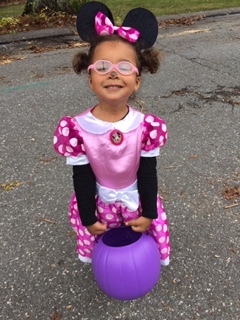 Speaking of Minnie, that’s what you were for Halloween. It was your first time trick-or-treating and you rocked it. We had that one incident where you accidentally broke my nose in November, but we’ll skip over that part. Instead, I’ll remember the minor surgery you had on your neck. You breezed right through it, ready to play with your brother by afternoon. Your strength and determination amaze me. The winter of your second year set a record for snowfall in Boston. It was hard to play outside because the snow was six feet deep in places, but we managed. You made your first snowman, too. We called him Olaf, because we’re original like that. You’ve been working on your music appreciation and dancing all year. And man, you can already cut a rug. Your favorite artists have run the gamut: Justin Timberlake to PSY, Taylor Swift to Bruno Mars, Meghan Trainor to Stevie Wonder. Plus, all the oldies from the 1960s that you and dad sing together. 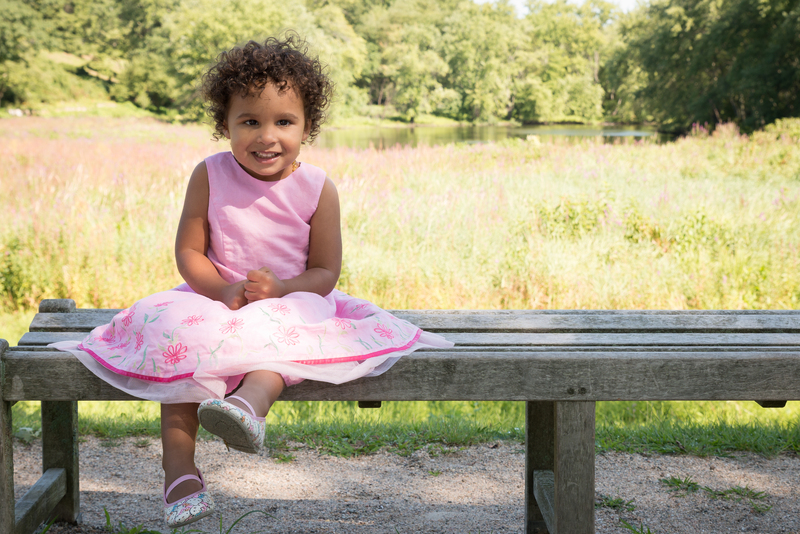 And, perhaps your biggest move of the year: You started preschool in January. Settled right in. Didn’t even cry on your first day when we left you there. There’s that bravery thing again. 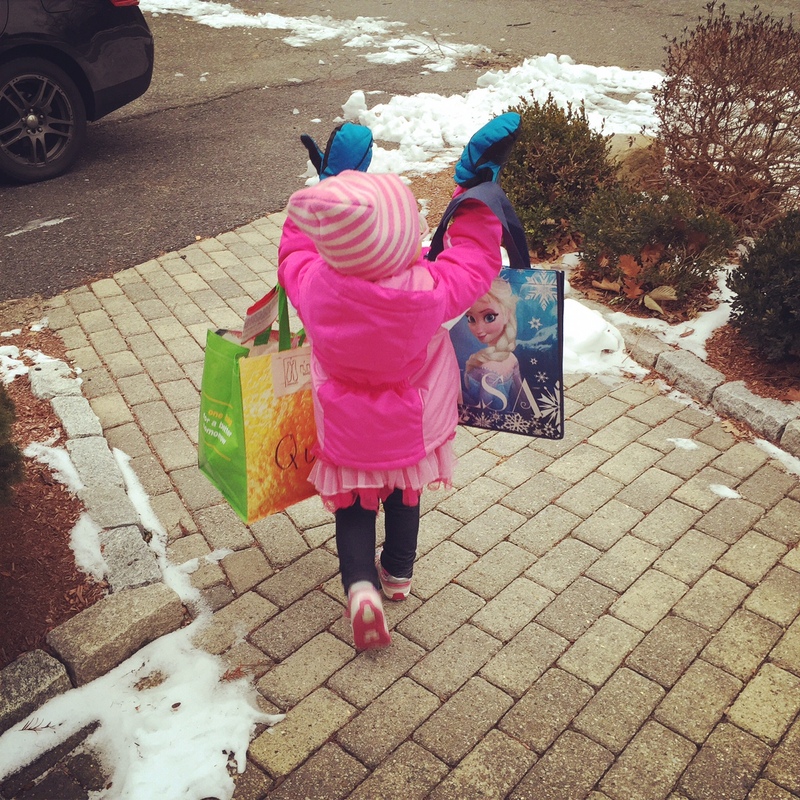 The bag of snowpants and boots were almost as big as her — no problem. Over this past weekend, you seamlessly moved into your toddler bed from your crib, which is now dismantled, never to be used again. The last shred of you being a baby, gone. Just like that. It makes me feel a little sniffly, but I can’t wait to see what the future has in store for you. Happiest birthday Sweet Pea. You are my sunshine. Thank you so much. 🙂 It does — I know when I’m sending her off to kindergarten, it will seem like two seconds ago that I wrote this post. Yes, and we are the ones tearing up inside! They are so resilient. 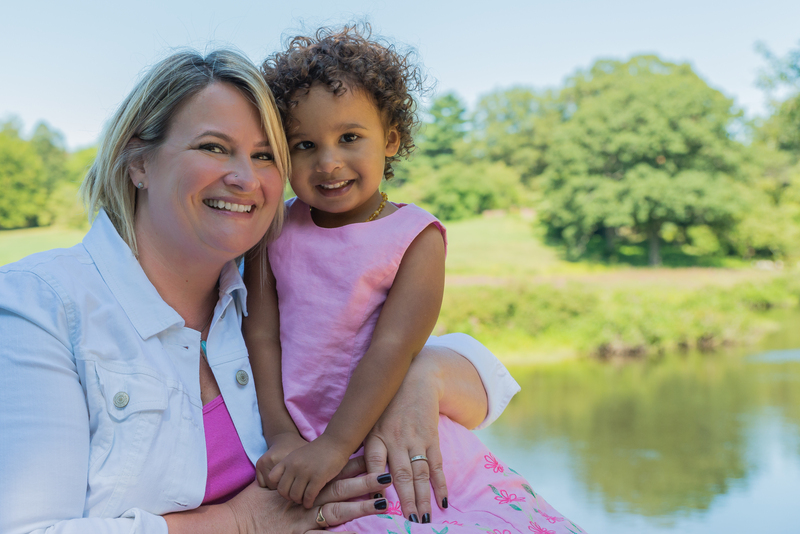 My little one will be 4 in November so she missed the school cutoff date. Our kids will be entering Kindergarten in the same year. We can cry together. What a beauty! And what a ‘Sweet Pea’, indeed. My own ‘Sweet Pea’, AKA The Child, celebrates her birthday today too. She is 24. But in my mind, she is eternally 4. Enjoy!!!!! 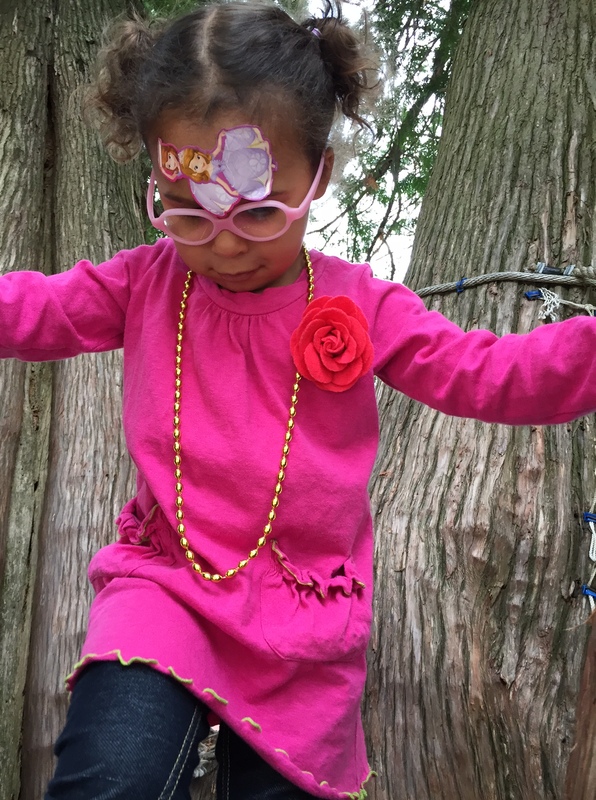 This entry was posted on March 23, 2015 by Maisy Fernandez in Happiness, Parenting and tagged birthday letter, birthdays, glasses, Halloween, Minnie Mouse, tutus.